Chelsea FC will meet Bayern Munich, the current Champions League holders at Prague for UEFA Super Cup, courtesy their Europa League win last May. This high-profile encounter could be fathomed as a rematch of the 2012 Champions League final, which Chelsea won thanks to Didier Drogba. The managers at helm at both Chelsea & Bayern, Jose Mourinho & Josep Guardiola, who were appointed this summer, have taken the excitement levels of this otherwise inconspicuous tie to humongous proportions. Let us have a look at the information we need. DATE & TIME: August 30, 2013 at 14:45 EDT, August 30, 2013 at 18:45 GMT; August 30, 2013 at 19:45 BST; August 30, 2013 at 19:45 WAT; August 30, 2013 at 20:45 CAT; August 30, 2013 at 21:45 EAT; August 30, 2013 at 12:15am IST. VENUE: Eden Arena, Prague, Czech Republic. TV/STREAMING NEWS: Chelsea TV will stream the game live. The game is also available online on Sky Go in UK and Fox Soccer 2 in USA. The match will be telecast live on ESPN Australia in Australia, Sportsnet World in Canada, SuperSport 3 in Central African Republic, ZDF Sport & Sky Sport 1 in Germany, Ten Action in India, Italia 1 & Sky Calcio 1 in Italy, Canal+1 & TVE La Primera in Spain, Al Jazeera Sport +3 in UAE, Sky Sports 1/HD & ITVHD in UK, Fox Sports 2 in USA. CHELSEA FC SQUAD NEWS: Chelsea have travelled to Prague with their entire squad, barring the new signings Willian & Samuel Eto’o. Tomas Kalas hasn’t yet recovered from his fractured leg. Mourinho has confirmed David Luiz is fit, but will decide before the match whether he is ready to start a game. 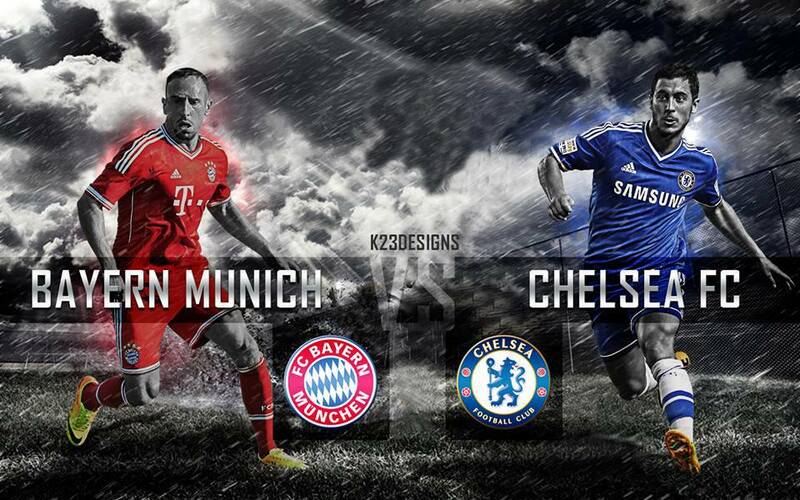 PREDICTED STARTING XI: Cech, Azpilicueta, Ivanovic, Luiz, Cole, Essien, Marco van Ginkel, de Bruyne, Mata, Schurrle, Torres. BAYERN MUNICH SQUAD NEWS: Bayern had an injury scare in Schweinsteiger against Freiburg, but the physios have declared him fit to play. Thiago Alcantara however is out. Javi Martinez is returning from injury which he picked up on national team duty. PREDICTED STARTING XI(4-1-4-1): Neuer, Lahm, Dante, van Buyten, Alaba, Schweinsteiger, Robben, Goetze, Kroos, Ribery, Mandzukic. Chelsea have played Bayern thrice in Europe, the results being a win, a defeat & a draw. Didier Drogba was the only player to have been in scoresheet on all three games. This will be Guardiola & Mourinho’s 16th meeting. Pep leads Jose by 7-5-3. IN A NUTSHELL: A win will give either team a trophy to begin the season with. A defeat will leave behind lessons. However, neither a win nor a defeat should play a crucial role in the fate of both teams this season. It should be interesting to see how Mourinho’s young lads take on the finished products of Bayern, whom Guardiola is molding into “Tiki-Taka” magicians at the moment. Who is dis one… !!! Are you a learner? Bayern will win tonight,no doubt and I won’t be dissapointed because they are already a complete and finished product,even before pep joined.Mourinho is still building this squad.Even if we loose by 3 goals,no problem,this league season is ours for the taking. He should have just played Eto’o.He has an axe to grind wit pep and that cud destabilize pep to want to. Look more defensive,a paranioa coming from his first trophy loss to Dortmund in d german super cup.Jose,U should play eto’o and Willian since they not injured,willian should play together with Mata.He should play a 4-2-3-1.4(cech,Aspi,Ivanovich,Terry,Cole)2(essien,Ramires)3(willian,mata/hazard or shurlle),1(eto’o).he needs to choke that midfield area,where bayern likes to play with equally skillful,physical midfielders. The starting lineup the articlee has is so idiotic. no hazard, no terry, no ramires are you mad or something? LOL no Hazard, no Terry, no Ramirez and no OSCAR! Seriously?? I mean u really think chelsea would get into a match like this without Eden Hazard? Dont you know who is the playing as a Full back for Bayern? jose should start with luiz ,cahil,cole ,ivanovich at the back while in the middle ,ramires,oscar mikel ,willian,striking force should b very strong includes etoo and hazard.peter cech as the goal keeper. I think mou is confused. all he needed was a striker in Eto’s caliber which he has acquired. not playing Mikel against man. u. made him the flop of the match. not starting Mikel against Bayern where he Mikel’s performance was tagged his best performance for chelsea will mar his chances of winning. dropping mata and moses for schullere a big mistake. for ur information mata is Chelsea’s player of the year for last two seasons, nominee for PFA award last season. mou. do the right thing before u rubbish ur records in the midst of sufficiency. Its gonna be real tough but Jose stands a better grounds to win….. Chelsea really needs a strong midfield to win this match.. Don’t forget Bayern has two good flanks.. Ribbery and Robben.. It would have been a better decision if morinho will start Lukaku…. Torres, well he’ll the manager but Lukaku does it better in a match physical like this..
Why is everyone lamenting as if we have lost ?Its high time we gave our team all the support.I know it will be tough but we can succeed.Go Chelsea Go! well well is so beautiful to hear this again,well this match is go to be a wonderful game because the two coaches are lions i have to save my comment for now,i know there we be a winer out of the two clubs. judging by the fact that bayern munich won is the reigning champions league winner,i think they are a bit ahead of chelsea atm,but chelsea is also a gud tym,so a gud game can be expected. Mourinho should deep hand well for the selection here,we need oscar,mikel,lukkaku,moses and mata,Up Blues.